Ricky has been engineering for over 8 years in the industry. He has worked on hit anime shows such as One Punch Man, Durarara, Hunter x Hunter, Persona The Anime, Kill la Kill, Toradora, Fate Zero, Love Live, K-On!, and many more. He also dabbles in original animation and video games. Working on shows such as Rick and Morty, Marvel's Guardians of the Galaxy animation, King's Quest, Overwatch, World of Warcraft, Resident Evil, and more. Bang Zoom! 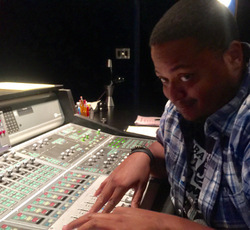 has been his home over the duration of his career but occasionally works sessions at Cartoon Network recording shows such as Adventure Time, Steven Universe, Ben 10, We Bare Bears and Clarence. On his free time he plays video games and searches for the perfect memes and Gifs to spam text his friends with. His addiction to gifs is a problem and he knows it.